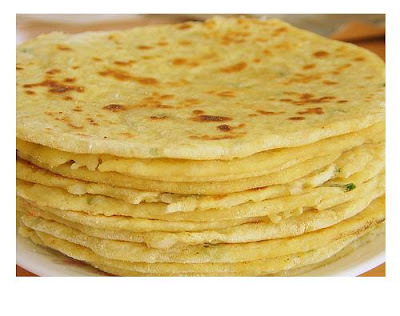 Gujarati thepla is not just about methi thepla although it's a more famous version of theplaa. Here I have written about masala thepla or spicy thepla. You can also use jeera along with ajwain to make masala thepla. A pinch of turmeric powder added to the dough gives a nice yellow color to the theplas. 1. Take atta in a bowl and mix all other ingredients except oil to shallow fry. Add about 1/4 cup of water to knead into soft dough. Set aside for 20 minutes. 2. Take a ball (peda) out of the dough and roll into a thin 5-6 inch round or thepla, dusting with dry flour to prevent from sticking. 3. Heat a tava (griddle) and cook this thepla from both sides brushing with oil. Cook till golden with brown-black specks. Serve masala thepla with chutney or as a bread with some side.